Gary could be saying..."My God is greater that this cancer!" Over 35 years ago I wrote a note of encouragement to a young, promising catcher with the Montreal Expos, Gary Carter. As a result of that initial contact I was invited to present Bibles to the entire Expos team in 1976, their last year at Jarry Park. Almost the entire team attended the chapel service that Sunday morning and friendships were forged that have endured the test of time. My friendship with Gary Carter is one of those that will last a lifetime. Naturally we were saddened in the past week to learn that Gary has inoperable brain cancer. Gary is a strong, committed Christian and has the support of his loving wife Sandy and their children and grandkids. Please pray for Gary Carter! THANK YOU. 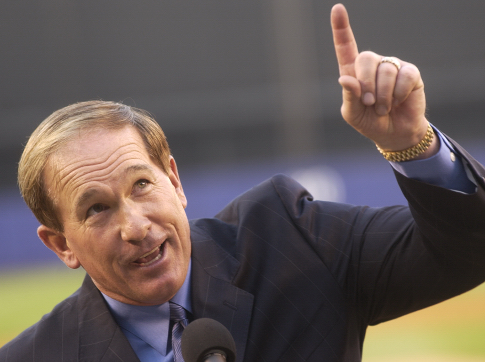 The news keeps getting worse for Hall of Fame catcher and former Met Gary Carter. Duke University doctors confirmed Tuesday that the 57-year-old Carter has inoperable Stage 4 brain cancer, but did mention paths of treatment. "The results of biopsies performed on the tumor in Gary Carter's brain have conclusively shown that Mr. Carter has a glioblastoma. While surgery is not a good option given the location of the tumor, we discussed an aggressive treatment plan with Mr. Carter and his family, which will include chemotherapy and radiation. ... Mr. Carter's youth, strong physical condition and fighting spirit will be to his advantage as his treatment commences." The Hall of Famer was returning to his home in Florida to begin treatment. Carter's family issued its own statement in conjunction with the Duke release: "While we are saddened by the news we received today, we take comfort in the overwhelming support and prayers that have been extended to our family during this difficult time. ... Gary was always a fierce competitor on the baseball field and that same tenacity will help him not only fight but win this battle. So please join Team Carter and continue to pray with our family." Carter first learned of the original diagnosis of brain tumors on May 21. According to a Carter family website, the father of three spent Memorial Day relaxing by his hotel pool and spending time with his wife, Sandy, children and grandkids. His daughter Kimmy Bloemers wrote on the family website: "When I was a little girl, I remember many many awesome memories with my family. One in particular was when dad would play a song called 'Break My Stride' by Matthew Wilder extremely loud throughout the house. When dad played that song, it meant it was time for the kids to dance with dad. That is dad's mission ... 'nobody gonna slow me down ... ain't nothin' gonna break my stride ... gotta keep on moving.' Dad has promised that he is fighting tooth and nail. He has and never will be a quitter. Dad is a fighter and a champion!"